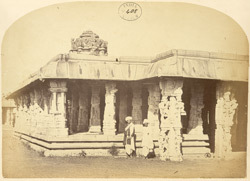 Photograph of the mandapa of the Someshvara Temple at Kolar from the Archaeological Survey of India Collections: India Office Series, taken by Henry Dixon in 1868. This compound was built under the Gowdas rulers of Karnataka, probably in the early 17th century. The sanctuary with a passageway is preceded by an enclosed mandapa or hall. An open mandapa has a central hall with piers carved with yalis and riders. as can be seen in this view. There is also a kalyana mandapa with fine carvings. The outer walls of the sanctuary are decorated with carved figures set in between pairs of pilasters.